A Go Bag is a bag of vital gear and supplies you put together in anticipation of an emergency or urgent need to leave with your essentials in tow. Many expectant couples prep go-bags for that momentous and nerve-wracking occasion when the new arrival signals his or her imminent appearance. For years, residents of California have been encouraged to prep go-bags just in case the big earthquake that’s been predicted for what seems like decades finally strikes. People living in areas prone to severe weather from tornadoes, hurricanes, or winter snowstorms often have go-bags to help them endure days without electricity, phone service, and/or potable water. But go-bags aren’t always needed in response to emergencies. Mobile professionals routinely have mobile office go-bags at the ready—bags that are either pre-loaded or that can be filled in minutes with all the gear, accessories, and supplies they need to bug out on short notice should a business need arise requiring them to travel. Some even have two types of go-bags at the ready, one for local and regional travel and one packed for travel by air. 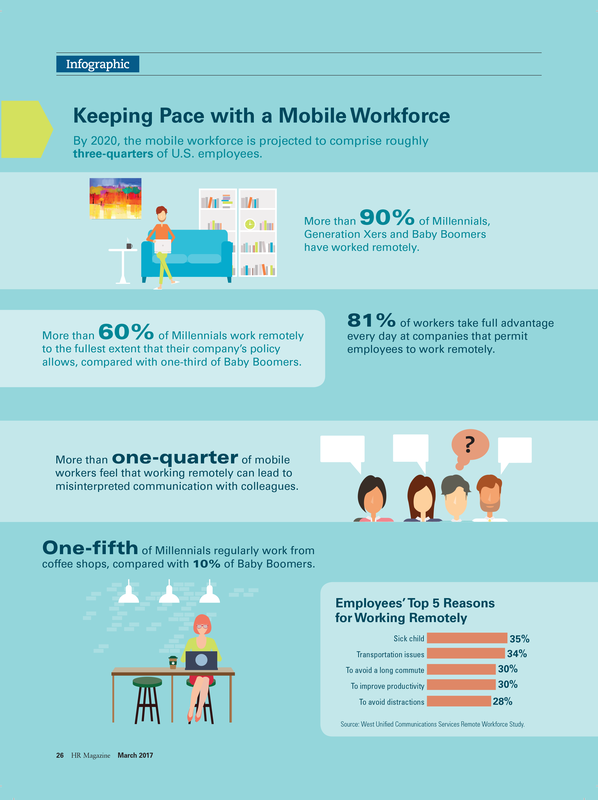 Are you part of the growing mobile workforce? You are if you commute to work by phone, computer, or by way of the Internet more often than not, or if you find yourself on the road (or in the air) for work a preponderance of the time. Once the purview of IT professionals and other techies, the ranks of mobile professionals have grown to include just about any profession where all or part of a job can be done remotely. Many call centers (both inbound and outbound) are now staffed remotely as is much of the work done by professionals in the fields of online marketing, teaching and instruction, accounting, data entry, freelance writing , virtual assistance, and online surveying. According to the Society for Human Resource Management, by 2020 the mobile workforce in the United States is expected to comprise nearly 75% of U.S. employees. Similarly, MWorkfroce.com estimates that by 2020, the number of U.S. mobile workers will grow to 105.4 million, a jump from 96.2 million in 2015. When the term “in the bag” originated in the early 20th century to mean “virtually secured,” who would have thought it would be so apropos for the 21st century? Mobile professionals want to know their gear is ready to move with them when they need to go. The last thing they want to be doing in the pre-dawn hours is fumbling around for their cords and chargers, knowing they’ve got to be on-site in a client’s office two time zones away by noontime. They can’t afford to leave something behind or, worse yet, have something get damaged along the way. For more than 15 years, Mobile Edge has been an award-winning industry leader in producing innovative and stylish cases and bags for mobile professionals and their gear. Mobile Edge understands that the gear you’re carrying is of utmost importance to your business success. We want you to be able to travel with confidence—whether it’s across town, across the country, or halfway around the world—knowing your gear is safe, secure, and organized. We want you to be able to just “grab your gear and go” with no worries, no hassle, and no fuss. Mobile Edge cases, backpacks, and bags . . .
Come in a variety of styles, shapes, and sizes to meet the needs and fashion sense of busy professionals. Feature dedicated padded compartments for laptops, tablets, and notebooks. Help professionals get and stay organized with separate sections for files, folders, magazines, and accessories. Are rugged, yet comfortable and ergonomically friendly. Come in styles that look as good as they perform. Feature our famous lifetime warranty. Mobile Edge is the market leader in checkpoint-friendly Laptop Cases. Exceeding TSA guidelines for checkpoint-friendly carry-on luggage, Mobile Edge’s ScanFast™ Collection of bags for both men and women are designed so that you can leave your laptop in the bag when passing through airport security checkpoints. Mobile Edge’s Professional Rolling Laptop Case and the matching Professional Backpack, which fits securely atop the rolling case using a trolley strap, are perfect for those who need to bring their mobile offices with them. Stylish, durable, and highly functional, the laptop case features an adjustable compartment to fit laptops, tablets, and notebooks from 13 to 17 inches, while the backpack holds laptops and other devices 13 to 16 inches. Mobile Edge’s Graphite Line special collection represents a fresh, edgy take on seven of our most popular and bestselling cases redesigned using a new, premium graphite-colored nylon material combined with a fashion-inspired interior lining. The result is a collection of user-proven products that fit and protect a wide range of devices, accessories, and gear. Popular with professionals as well as gamers, the full-featured CORE Gaming Backpack offers the ultimate in style, transport, protection, storage, and easy access to laptops, accessories, and all your gear. Constructed of durable ballistic nylon, it’s sized to hold all popular models of laptops up to 17″ to 18″ and features three large storage sections pre-wired for a power bank or external battery; four side accessory pockets for cables, phones, or water bottles or snacks; and a built-in external USB charge port. Visit www.mobiledge.com to browse our extensive collection of mobility solutions for both men and women. For the next 10 days, enter Promo code MOPRO and get 20% off your purchase of a Professional Backpack and Rolling Laptop Case Combo, a bag in our Graphite Line, or a CORE Gaming Backpack.